AN UNPRECEDENTED HARVEST is coming. This has been prophesied for years, even decades. Many have seen this. I’m going to refrain from throwing out numbers. But I do want to affirm the deep longing of the Father’s heart: An inkling of the coming harvest is indeed upon us now! And it is going to start in barns. Indeed, humble dwellings. It will be a revival unto the harvest. 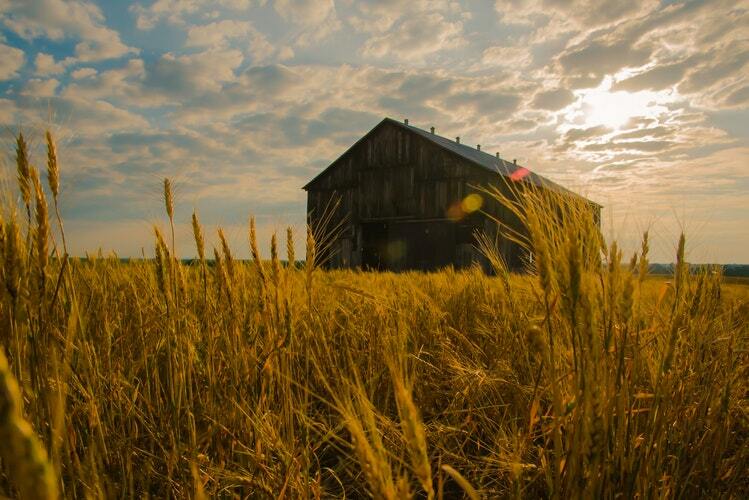 In ancient biblical times, barns were used to store the harvest. In pre-Roman times, barns were storehouses that were underground in caves, cisterns, or holes that were covered to ensure protection from the elements. The goal was to shelter the harvested goods from inclement weather and other dangers could cause damage. Now let’s fast forward to the modern times. Going back a few hundred years, community events known as barn-raising were the norm. Communities banded together to either build a barn from the ground up or help rebuild a fallen barn in disarray. Oftentimes the survival of a farming family depended on the generosity of their fellow neighbors within the community. This custom became quite the norm. Likewise we have stepped into a season where there are many barn-raising of newly built barns; but also those to salvage barns on the brink of ruin—perhaps more aptly stated as a barn-raising from the dead! These barns certainly have seen better days. Their tired bones groan under the weight of rotting wood that’s fallen into disrepair, but the Lord is restoring such old barns that will be used as hubs of revival for the days ahead. This is a key we must grasp right now: That which gives us a glimpse into our past history is but a foreshadowing of what will transpire in the days ahead. Even right now the Holy Spirit is orchestrating many “behind the scene“ activities that will lead to miraculous barn-raising events throughout the U.S. Many will transpire prior to the coming decade of the 2020’s. I’ve been carrying this word since the spring of 2016, waiting to release it publicly. At that time I clearly saw a three year window from 2017-2020 with the Father’s grace extended to those who have dreamed such dreams of raising up a barn on the verge of ruins. This could be a call to salvage material from a barn built centuries before to be rebuilt on land that the Lord has given to you. Or perhaps you are called to build a new barn from scratch. Is there an old family barn that you have heard about that is no longer standing, but your heart flutters every time you viewed such old photos from the past? Perhaps you have a barn still standing, but in need of ample work; yet as you prayer walk the property, your heart is deeply stirred to see it restored as a storehouse for the coming harvest. Maybe your eyes are drawn to a large barn that you see in the distance as you drive by it and all you can do is simply pray, Lord, that barn belongs to you … let it become a hub of the coming barn revival! I have only shared this word with a few, but I’m amazed how many have also seen and felt similar things. Still others drive by barns with an irresistible drawing that intensifies unabated over time. Thus, the question percolates within, “Why am I so drawn to barns?” Or maybe it was a picture of a barn that spiked your heartbeat as you daydreamed the dreams of the Father’s heart: a lowly barn hosting Holy Spirit meetings where scores of unbelievers cry out like the jailer of Acts 16:30: Sirs, what must I do to be saved? Others still have had vivid prophetic dreams and visions in the night with revival breaking out in barns across this nation. Could it be the Lord to orchestrate such a barn-raising in the “highways and byways” (Matt. 22:9) as a sign of the coming harvest? That moment is upon us. Right now. Not tomorrow. Not next year—right now! Now is the time to prepare for the coming harvest. Jesus spoke pertinent words for us at this juncture: Do you not say, ‘There are yet four months, then comes the harvest’? Look, I tell you, lift up your eyes, and see that the fields are white for harvest” (John 4:35). We are in the initial trickle of this unprecedented harvest; therefore, we must prepare now to reap even a greater harvest in the days to come. We are already halfway into this three year window of extended grace to raise up barns across this nation (and beyond). All of this is from the Lord as He prepares His people for a barn-raising in this hour that will precede an unprecedented move of His Spirit. What is your story? What is the Father nudging you to pursue in preparation to reap this unprecedented harvest? Though these barns have presently seen better days—their best days are ahead as you obey the the Father’s call to restore these barns as hubs for revival unto harvest! Join the Facebook group for BREAKTHROUGH TRIBE to connect with others who want to see a barn revival unto an unprecedented harvest. You hit the Bullseye.. Everything stirs up within me.. walking together with Jesus in the Harvest Fields.. listening intently as he leads, where to build, where to harvest….with a Go in my heart..
Gail, as always, I so appreciate you and the heart you carry for the Lord. I can’t wait to see what the Lord brings forth in Rhode Island. Blessings to you dear sister. Brian, your word is well received and confirms what is happening in the Turtle Mountain Tribe in North Dakota! Countless hearts have been in sorrowful prayer over the conditions in this small community on this reservation – addiction, poverty, depression, suicide, crime … and false religion. Many are sensing and anticipating an awakening coming to us – just recently a group from a nearby city came to pray with us – they sensed it too. They are sending a young itinerant preacher of Jamaican descent to hold church meetings! Last week was our first. One of the Prayer Warrior Lady’s hosted, setting up chairs in her yard ~ There we were blessed by Holy Spirit who inspired dancing and deliverance and his joy! Please do pray with us for a building to meet in, Holy Spirit to bring in those hurting and needful of His ministrations, Hallelujah! Perry Stone has also been predicting a Rural Revival; a move of God that isn’t found in the mega churches but in multiple small churches throughout the rural communities of the eastern United States. A move of God is coming; a move to bring in the lost for His Glory. Thank you Renee for pointing that out to me as I was not aware of this previous word. Someone else also pointed this out to me after I posted this word last month. It’s always good to know what others are also saying prophetically. Much love to you and Dan as you continue to labor in the Shenandoah Valley. What an encouraging word for us personally. I cannot tell you how long my husband and I have desired to own a farm – and we especially love those old barns! We have been praying for over 15 years for the “right” property and it seems to be mysteriously still hidden from us. We have visited so many properties around New England and fallen in love – not with the house, but with the barn (and the land!) We’ve talked of holding “church” in some of them that just seemed to welcome heaven to earth with their natural connection the land and sky. What a fun and satisfying word for my spirit today. Thank you for sharing it. I hope that perhaps this might be something we “get” to do this side of heaven! Many blessings to you & family. Look forward to reading your next posts. P.S. – Would you please add me to your email list? I thought I had signed up but I am seeing your posts only on Facebook. Funny, last night I was praying for a friend and looked up the meaning of his surname and one of the meanings was “barn”. Now it makes so much sense! Sharon, come join us at THE BARN REVIVAL in Fredericksburg, Virginia this spring. Here’s a link to learn more about this national barn raising moment before the Lord. Thank you for your post! Loved it! It resonated in my heart. I am a Hoosier who has a deep passion for Jesus and sharing HIS good news … for the coming harvest. I have a Red Barn (previously a 3 stall Horse Barn) that is utilized for worship, discipleship training, Bible studies and renewing/refreshing our spirit in Jesus. Last year, God set my heart afire with a vision to unite individuals in the Marketplace, Ministry leaders and “Any/All” who share the same above passion!! Eagerly awaiting the next steps! Marcia, thank you so much for taking the time to read through the entire word. I’m grateful that it ministered to your heart. Are you aware of anything of this nature transpiring in your region? Thank you so much Brian for releasing this Word!!! Yes, there is an undeniable sense of the Holy Spirit working in our area. A prophet spoke a word over my husband and I severel years ago that our area (southside of Indy) was going to be a place of peace for others. And IHOPE (Indianapolis House of prayer and evangelism) held a worship night in our red barn about 2 years ago and an IHOPE leader spoke a word over the barn that it was going to be “ground zero”. And a few days prior to the worship night, The IHOPE missions director and I were meeting to pray in the red barn. And she said that earlier that day, she had a vision of a dove flying over the barn. My twin sons held a 10 week discipleship training in the red barn about two months ago for myself and 8 of my friends …. and I feel God compelling me to lead a similar training sometime in Sept or Oct…. but instead of a 10 week session. I will lead an intensive 2-day training using the Zúme program. I am very excited to see GOD at work and eagerly awaiting to see what HE does next. My wife and I received a vision from the Lord regarding a farm and a barn to be remodeled which would host worship nights and retreats catering to business owners, entrepreneurs, creatives, etc. We released our website for fundraising and immediately blew past our initial seed goal. In less than one month we have secured the property and launched the campaign for our barn renovation. It was obvious this was the Fathers heart as there has been no striving to make this happen and lots of grace! We are pleased to now launch the barn renovation campaigns and are certain we will be able to renovate by the end of the year with retreats beginning in Spring 2019. We have had numerous visions of a major revival happening on this land that will reach many unsaved people! Let it be Lord! Your word brings major confirmation! A visiting Pastor from Tennessee sent me the link to your article today after he noticed the name of our Sunday School this morning (30th September 2018). At that time I also received the acronym B.A.R.N against which I wrote the words Building A Revival Nation on a note. Greatly enthused by what I believed God was going to do in our land e.g. “raise up barns across this nation (and beyond)”, not knowing when or how it might happen but always looking for His leading, I have kept this note in my Bible and in my heart for 14 years. Several children (4 to be exact) jobs, house moves and churches later and the Lord has brought me back to the church where I was saved, in the small rural market town of Gainsborough in the heart of Lincolnshire the flattest county in the land, well known for its agricultural heritage. So in January 2018 when my wife and I (did I mention she’s a French beauty?) were given the opportunity to head up and transform the Sunday School within the church we called it B.A.R.N Children’s Ministry. However, “tired bones [that] groan under the weight of rotting wood that’s fallen into disrepair,” certainly describes what we inherited and you might say that we are still in the process of “barn-raising from the dead!” whilst the church itself is still going through a phase of both structural and spiritual refurbishment (hence the visiting Pastor from Tennessee). If it helps, our church building looks like a red brick barn and sits on a plot of land slap bang at the centre of Middlefield Lane (right where a barn should be in the Middle of a Field) surrounded by 3 housing estates (white fields) where some of the poorest and most needy children and families in town live. At present “We are in the initial trickle of this unprecedented harvest;” as you have observed but we are eagerly expecting more, so much more! Thank you for your timely article which has been a real blessing and encouragement that we are on the right track, at the right time and affirmation that God is indeed preparing us to reap the harvest, not only in the US but farther afield! Chris, what a remarkable testimony. Thank you for taking the time to share your story as it was a delight to read. Those of us over here in the U.S. are absolutely standing with you as you pioneer the kingdom work that the Father has called you and your lovely bride to pursue in this hour. Please keep us posted on your development as it pertains to the B.A.R.N assignment the Father has entrusted to you. Many, many lives will be touched as the beauty and splendor of Christ Jesus is unveiled to this emerging generation. If you’re on social media, find me either on Facebook or Twitter. Blessings! Ranee, thank you for taking a moment to share the recent activities surrounding your son. I certainly see the hand of the Lord on this. Be encouraged. Interesting that he’s just outside of Seattle. I recently have had Seattle on my heart due to what the Holy Spirit has spoken to me. Just yesterday my two young daughters asked me as we were driving to church, “Dad, where is Seattle?” So Seattle is on my radar. Please lift us up in prayer as we prepare for THE BARN REVIVAL at The Glasgow Farm in Fredericksburg, Virginia where we’re calling a nation to come together for a national barn raising moment before the Lord. Again, thank you for sharing this with us. Please keep me posted. Blessings!